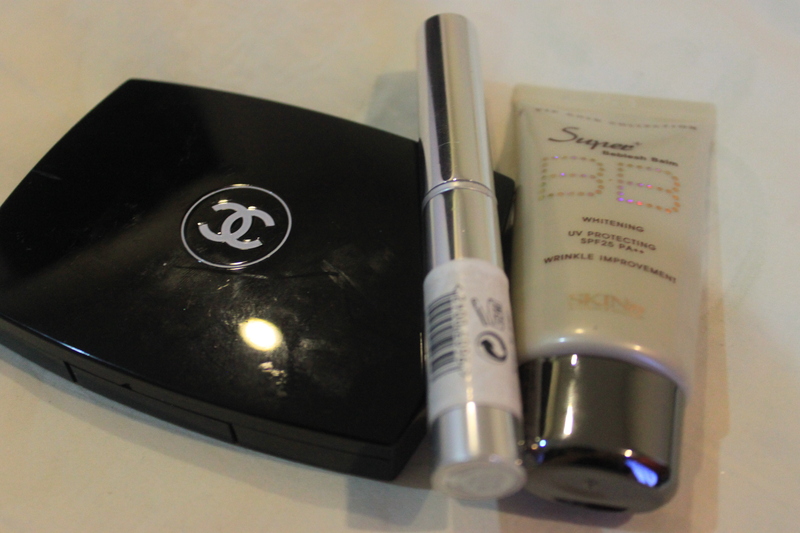 Quick Look: Whats in my MakeUp Bag! What is in my make up bag! 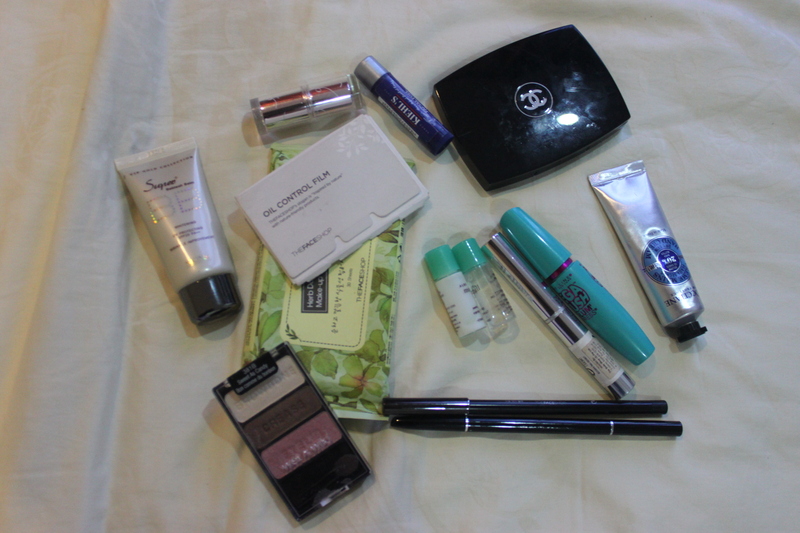 Its a really messy make up bag content as you can see over here. Sometimes, i don’t have the time to wear any make up at all before i step out of my house, so i bring around all the basic make up (meaning no brushes required make up). I would usually do my make up in the car on the way out, which happens a lot. So i can’t bring with me eye products that are highly pigmented that needs brushes to blend out or bronzer and blusher. These are some simple and easy make up i carry around with me whenever i go out. Adding up to the make up on the go I don’t like the typical liquids since there is a limit in how much you can bring with you since my make up bag is quite small, i settled down travel size items, sticks or powdered version. This particular BB cream i just bought not long ago, its the Skin 79 Super Beblesh Balm in the VIP gold Collection. Even though the name isn’t like the typical BB cream, which means Blemish Balm, it is actually one. The coverage is not build-able but it has a medium coverage. It feels like a sunblock when applied. It helps with my oily skin as it controls the oil and makes my face feels a little dry, but it is just the feeling. I bought the Chanel Mat Lumiere powder foundation in 10 Lumiere in Hong Kong awhile back and i still have a lot of it even though i use it quite frequently. As a powder foundation, it gives medium coverage but on pores, i have to use a bb cream or apply concealer on it before putting it over to even out my skin. As a finishing powder, it helps with oil control and mattifies my skin. the body shop concealer stick is really easy to bring around, and i don’t have to worry about spilling. it has medium to full coverage. I know i just got my Wet and Wild “Sweet as Candy” trio eye palette, but i use this to replace my single eyeshadows i bring around, which was really inconvenient since it was taking up to much space. But like this palette, the single eyeshadows i bought from Lioele has a slight shimmer and they are not very pigmented. the Face it Styling Auto Gel liner is convenient to bring out compared to its gel counter part, which is my favourite next to my Chanel Stylo Yeux Waterproof Long Lasting Eyeliner in Ebene which i finished up awhile back. I loved the formula for the gel counterpart, and the pencil did not disappoint me as well although I can’t use it to tight line. The Maybelline Mega Plush Volum express is a birthday present that my friend got for me, and it was my first black mascara. 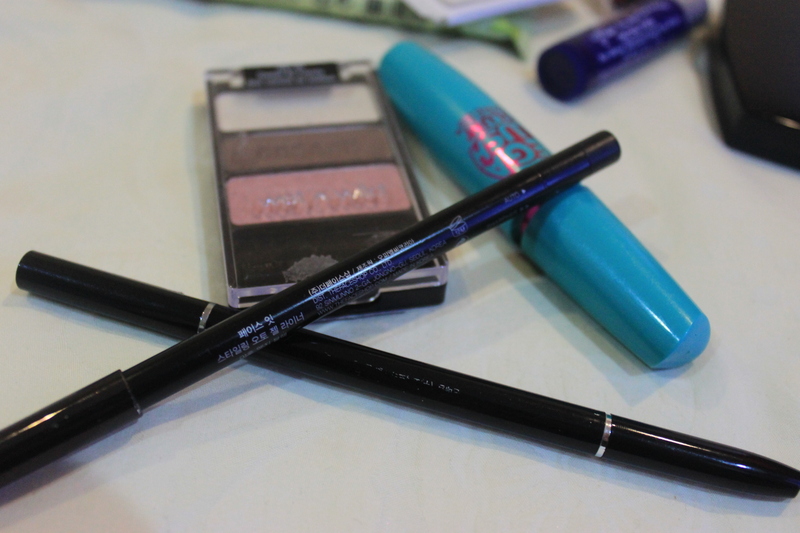 My previous one is the M.A.C wonder girl mascara in blue. Although I love the M.A.C one more as it is a dryer formula and does not transfer or smudge by it self, its not possible for me to wear blue on a daily basis right? and its already over 1 year so i had to get it of it. This isn’t my favourite formula, but it’ll do. My beloved Kheil’s Lipblam. It smells and taste like mentos (not that i’d lick it), which is very refreshing and it feels moisturizing on the lip. 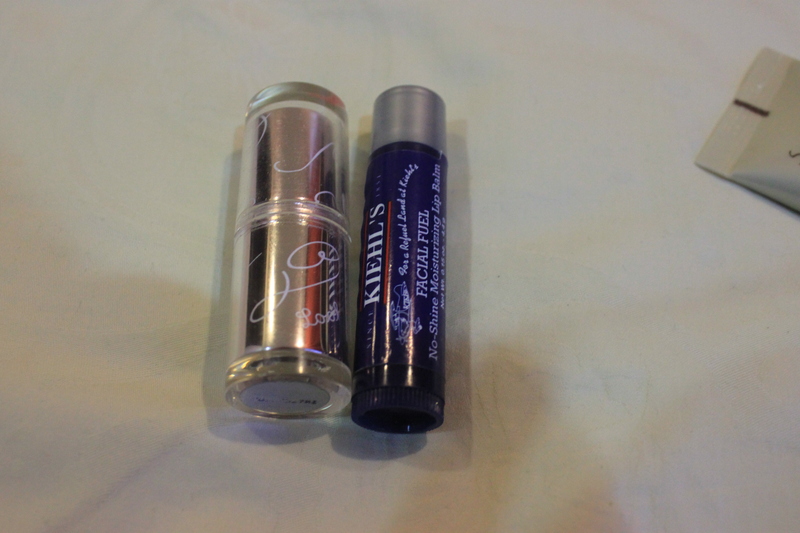 It doesn’t feel oily nor buttery like the Maybelline’s baby lip balm. I brought it to my Japan and Taiwan trip during the winter and it saved my lips. The maybelline baby lip balm did not work at all. Etude house’s “Look at my Lips” in number 16 “Love me pink” is a matt pink lipstick that does not around my lips and the pigmentation of the pink is the perfect “My lips but better” colour for me since i have pink lips, not pale lips. These are just for some things that i don’t bring all the time. Usually i bring them only when i’ll be travelling on plane or boat. Makeup remover and blotting paper from The Faceshop i would say is more important then the moisturizer and toner samples from Etude house in my case as i need it more. Most of my travellings are not long, a maximum of 2 hours. Sometimes makeup get smudged so the make up remover comes handy to clean it up. 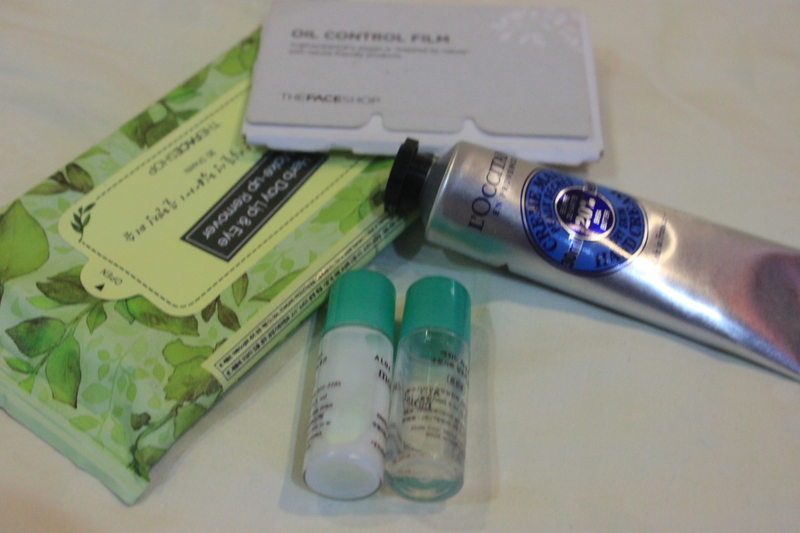 The blotting paper helps my oily face but i tend to reach it after my powder foundation.